In the first release of the CSC, detect and flux significance were related, since sources were accepted for inclusion in the catalog if their flux significance exceeded a given threshold. In CSC 2.0, three separate metrics are used to describe the significance of detection and flux determination. where P is the probability that an MLE fit to a point or extended source model, in a region with no source, would yield a change in fit statistic as large or larger than that observed, when compared to a fit to background only. 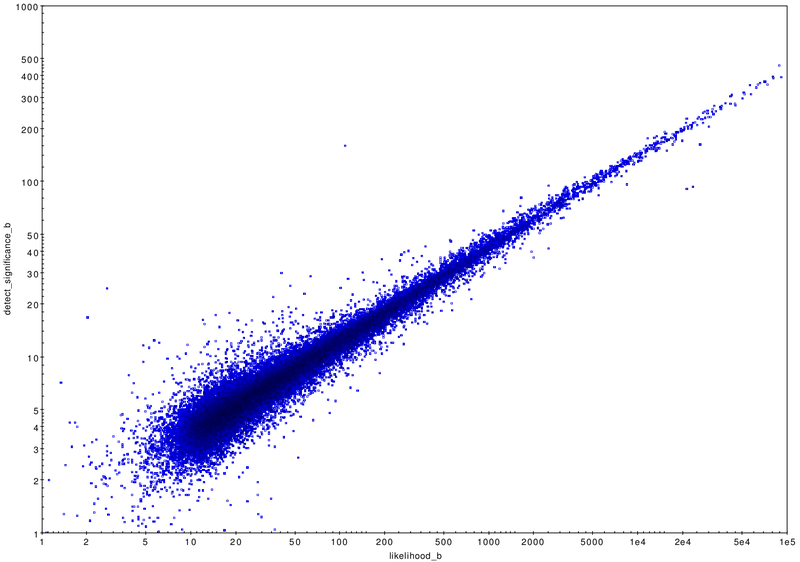 A plot of the detection significance vs. likelihood is shown in this figure. which are both used to estimate flux significance. The maximum likelihood and flux significance across all stacked observations and energy bands are reported as the master source significance and likelihood. Likelihood, detect significance, and flux significance are reported per band for all sources detected in the valid stack. The likelihood reported is the maximum of the likelihood determined from the MLE fit to all valid stack data, and the likelihoods from each individual observation, per band. Likelihood and flux significance are reported per band for all detected sources that fall in the valid field of view. Likelihoods are computed for each source detection in a stack, from MLE fits to data from all valid observations for the source. Likelihoods from each individual observation are also computed.